The most reliable quality data is like a picture of a starry sky. That's why we monitor more than 200,000 significant changes in the core data every week. There's no such thing as perfect data. But we come close. Atoka triangulates data from several sources, in order to at least double check it's quality. Our goal is to provide you with the best data on the market. The Register of Companies, envisaged by the Civil Code, was fully implemented by the Law 580/1993 concerning the reorganisation of the Chambers of Commerce and by the subsequent implementing Regulations, and its operation is entrusted to the Chambers of Commerce. The data indicated in Atoka as "Cerved source" originates from Cerved Group S.p.A., one of the official distributors for the Register of Companies of the Chambers of Commerce. These data are corrected, supplemented and enhanced by the daily work of Cerved analysts. The data that we indicate with the tag "Web source", such as website and social media addresses as well as keywords, originate from public sources (websites, social media channels, etc) scanned by automated programs that use algorithms very similar to those of common search engines (e.g. Google, Bing, Yahoo, etc). This data is then corrected, supplemented and enhanced by Atoka's editorial team and by its users. Atoka uses Big Data technologies and it applies a series of data transformation processes based on Machine Learning techniques. 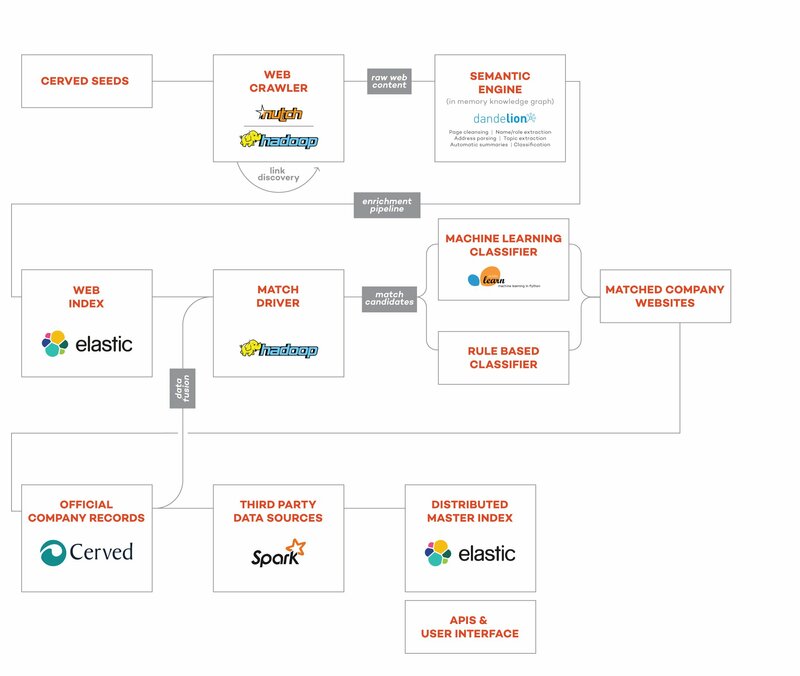 The stream represented in this image above is a simplified overview of the complex data curation process performed by Atoka on billions of different data points coming from various data sources. If you which to know more about the underlying technology, you can read this post (in italian ) by Michele Barbera.